As we bid farewell to many spring-breakers heading out of town, we quickly discovered there was quite a bit of adventure to keep Cam busy during his stay-cation here in Grand Rapids! Miss Amanda taught her buddy (and the rest of us) all about chicken eggs this week. She was pet-sitting animals and brought Cam there for a visit. The duo returned home with a dozen eggs, two of which were green! 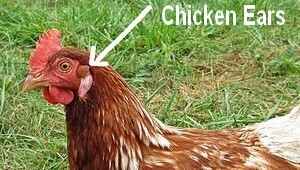 Amanda explained that the color of the egg a chicken lays is in direct correlation to the color of its ears. The following ear color represents the hue of the egg: white ears= green and blue eggs, red ears= white and brown eggs. Cam declared "that is pretty cool!" 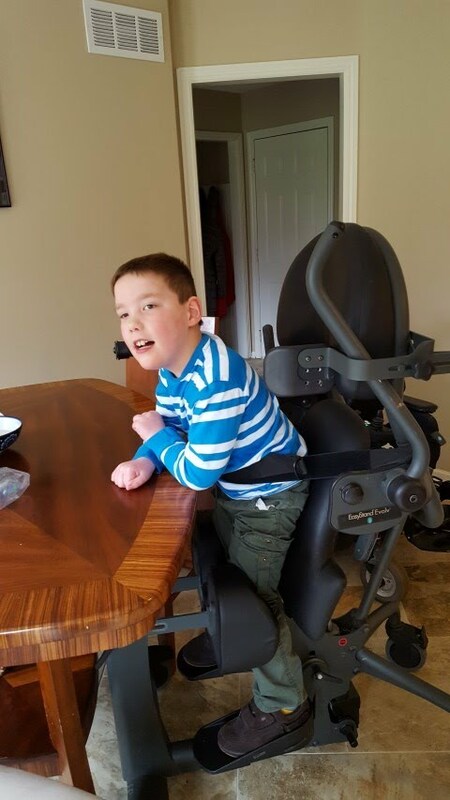 Due to the generosity of another family linked to Cam's PT at school, we are now using a 'stander' at home with Cam. This allows him to independently stand at a table. He and Amanda watched an interesting construction video about what Cascade Road will look like upon completion, which led to lots of questions and discussion. When Amanda & Cam were ready to venture out again one day, they discovered the van had a flat tire! Since Chris was working out of town, we called Emma's dad, Mr. Steve. He was able to help us out with the tire change (thanks Mr. Steve! ), which allowed Cam to visit with Amanda's grandparents, Ms. Mickie and Mr. Ken! These two have been our neighbors for 15 years so they've known Cam his entire life. He loves to visit with them and Cam and Ken share the same love of chocolate. It's even sweeter that Amanda is their granddaughter and these visits will become more frequent. We decided that Cam's break wasn't complete without taking in a movie, so Oma, Emma, Cam and Jane all headed over to Lowell to see the popular "Zootopia" film. After somehow depleting a large bucket of popcorn, we all agreed it was a great flick and we all highly recommend it! We've learned that sometimes, the biggest gift of all is just being present. Jane and Chris each managed to take a half day off of work on different days to spend time with Cam and the extra time with Oma, Amanda and Emma was the best!! Stay-cation was a big success! "Let's do it after lunch, Mom. I'm open!" "Ewwwwwwww!! Who would do it that?!" Cam's weather commentary: "This doesn't look like spring to me!"